Trang is a wonderful ambassador for Vietnam. A Young Vietnamese Opinion On The American War. My limited education of the ‘Vietnam War’ comes from biased American movies, so it was humbling hearing a young Vietnamese opinion on the American War. “Sometimes people ask me, why do you smile at the Americans and the French, they’ve been here in the war, they did many bad things to your country? How can you still smile with them now? 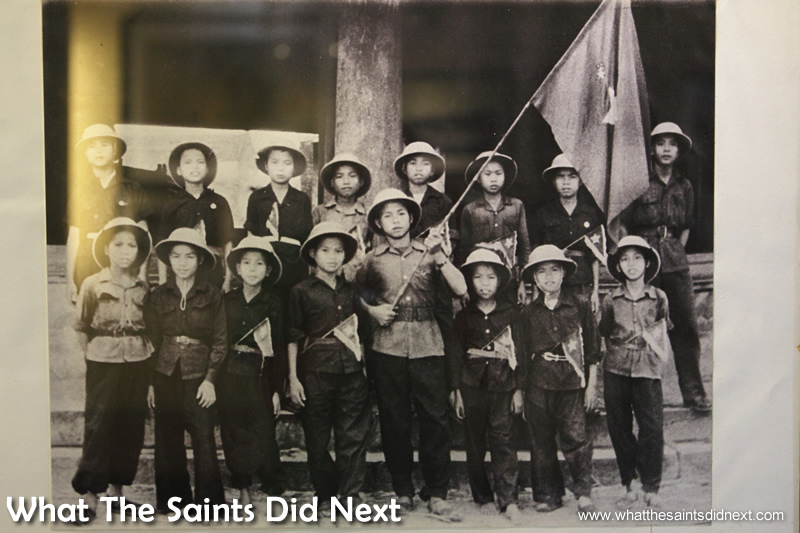 ‘Dinh Bang child guerrilla team (Bac Ninh) during anti-French resistance’ – photo: National History Museum. These are the words of 27 year old Vietnamese girl, Trang, or Emily as she is known to western visitors. We’ve struck up a friendship over the past week and we’re now stood chatting at the Hanoi Chic Hotel reception desk where she works. Having just returned from dinner I’m feeling the effects of the city’s namesake beer and a touch melancholy because our visit is drawing close. Trang’s shift ends at 10 and she’s grateful for the company. Outside on the street, bowls clink and hooters drone over the chatter of late night diners. I have to admit, my own knowledge about the country before now stems purely from Hollywood movies. The Viet Cong was often portrayed as the bad guy. Mortar squad of women guerrillas in Tinh Bien district, An Giang province, during the war with the US. “But,” continues Trang, “when I went to the museum in Ho Chi Minh city about the French and American wars and saw the pictures… I felt very…I don’t know how to say… very bad. You can get angry with them. Why did they do that? We are humans, but a different country. How can they do that to other people?” She swallows, her face turns a shade of red. “That time in the museum I got really angry. But, when I left I thought, okay that’s in the past,” she shrugs and smiles. Her forward looking attitude is humbling. Over three million tourists visited Vietnam in the first five months of 2015. The majority are from Asian countries. The biggest western country sources are USA and France. 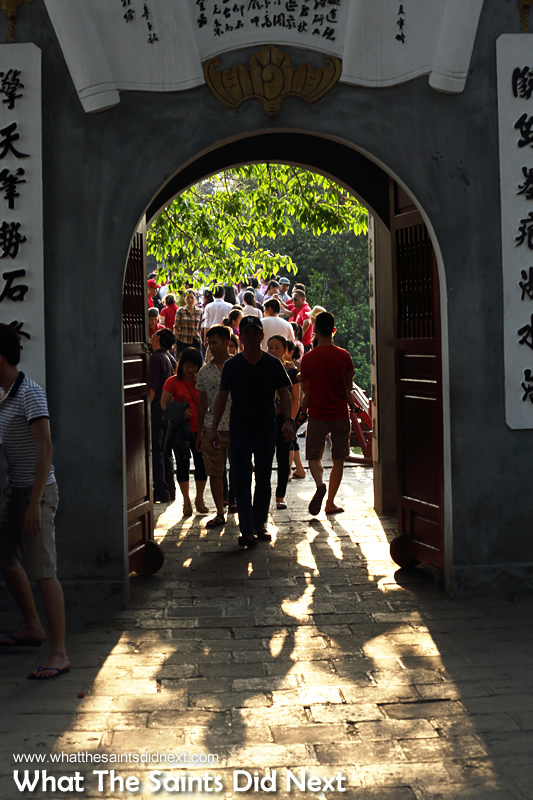 Many of these visitors flow through Hanoi. Tourists on The Huc Bridge on Hanoi’s Hồ Hoàn Kiếm lake. More than 3 million tourists visited Vietnam from Jan-May 2015. The scene in Hanoi on 30 April 2015, the 40th anniversary of Reunification Day. A Young Vietnamese Opinion On The American War. The US war ended 40 years ago in 1975. 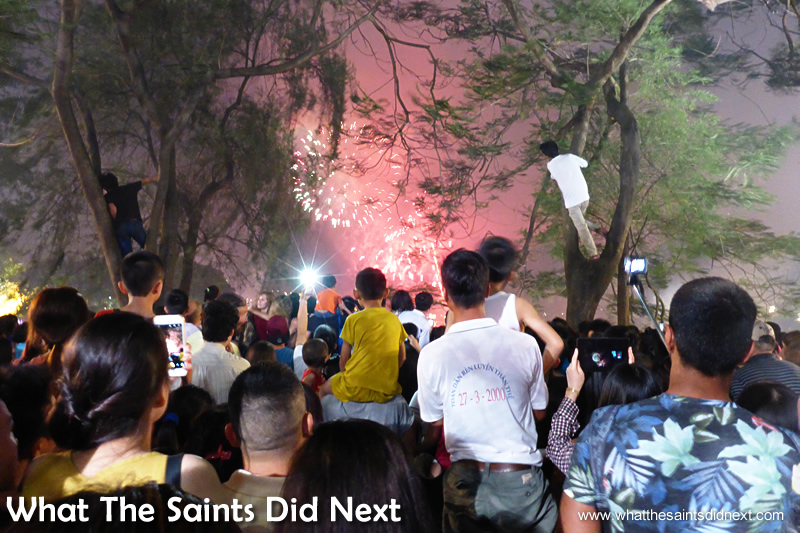 We happened to be in Hanoi for the anniversary known as Reunification Day. The streets were decorated with festival lights and a fireworks display marked the occasion. The conversation then lightens; I tell her about St Helena and we talk about music, food and travel. Originally from the coastal Thai Binh province, 115km from Hanoi, Trang has also seen a lot of Vietnam. “For me, you have to know about your own country so when you visit other places you can see what is different. 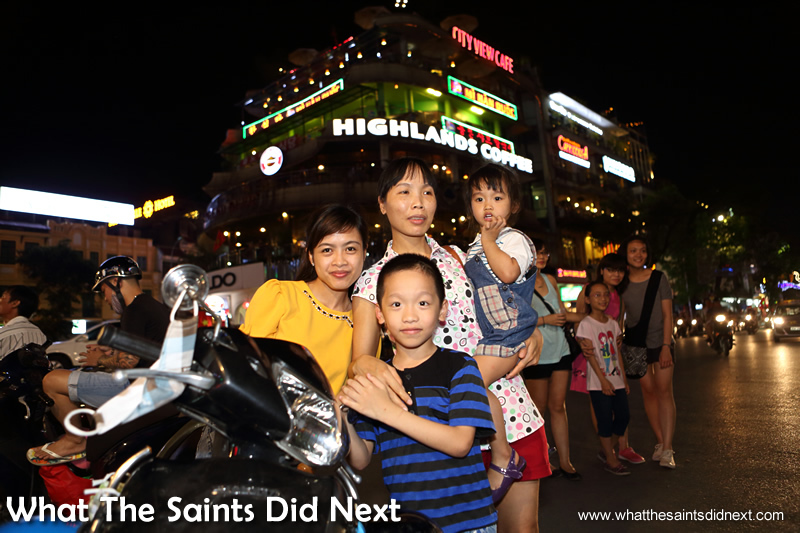 Many families can be seen enjoying the warm Hanoi evenings, strolling about together in the city centre. 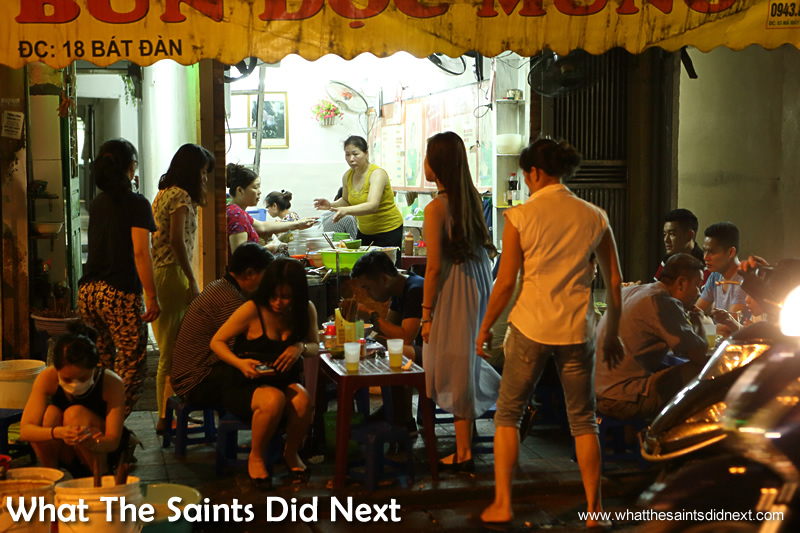 The noise of the street spills in as guests return from a night out, Trang hands over their key and bids them good night. We pick up the conversation. 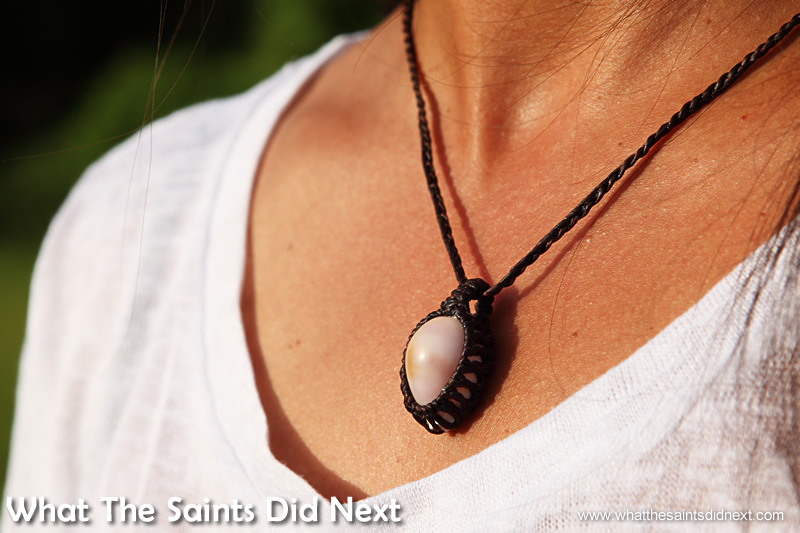 To occupy her spare time Trang makes jewellery with shells collected from Thailand and Vietnam using macramé. “I also like having small parties with family and friends, we go to Karaoke to sing and relax. Karaoke is very popular with young people here. Am I good? Sometimes! When I sing with someone else!” she laughs. I tell her I think it’s funny how everything in Vietnam is transported on a motorbike and that there are no restrictions on passenger age or numbers. “Not only in Vietnam also in Cambodia and Thailand!” she adds. 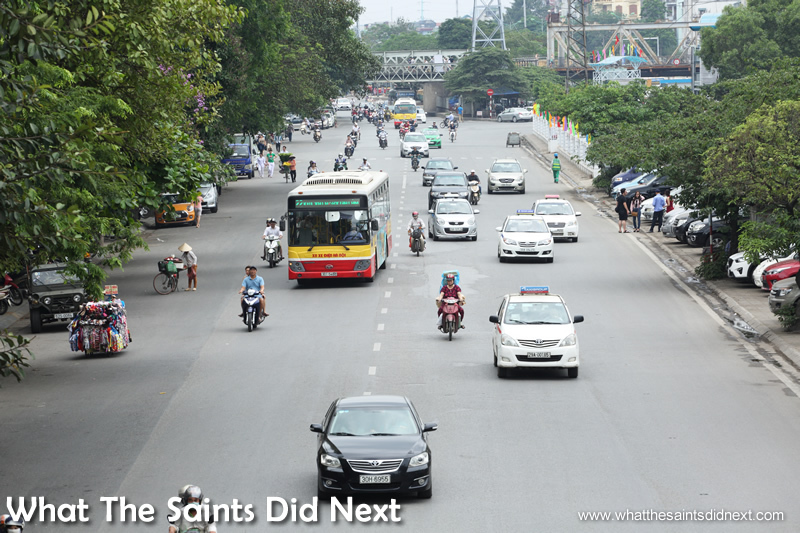 “I didn’t ride a moped until I came to Hanoi to study four years ago. But I prefer to travel by public bus; it’s cheaper and safer than a motorbike. 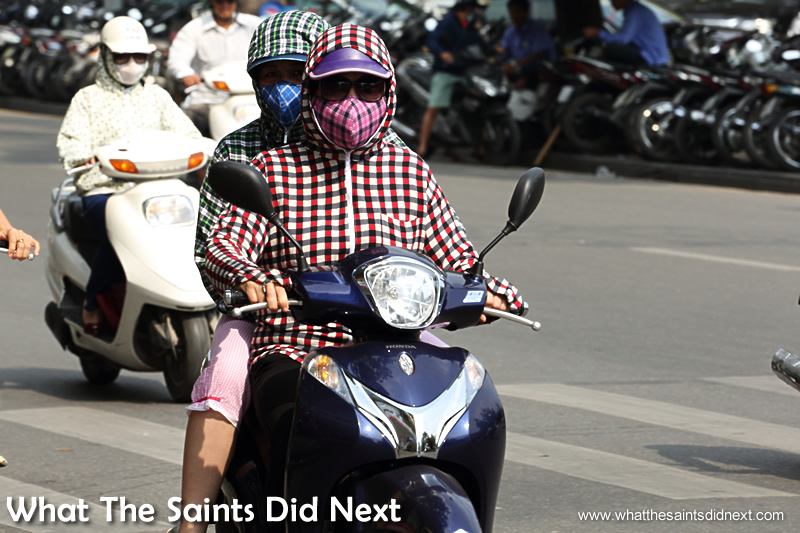 “Now that more people are coming to Hanoi it’s making traffic more crazy,” she says. Another knock on effect is housing demand. “I like trees but now they are cutting them down from Hanoi’s streets to make way for houses and the sky train.” The city is in the process of building a train system similar to Bangkok’s BTS. Hanoi is lacking a decent public transport system, but plans are already in hand to build a modern sky train system similar to Bangkok’s BTS. A Young Vietnamese Opinion On The American War. 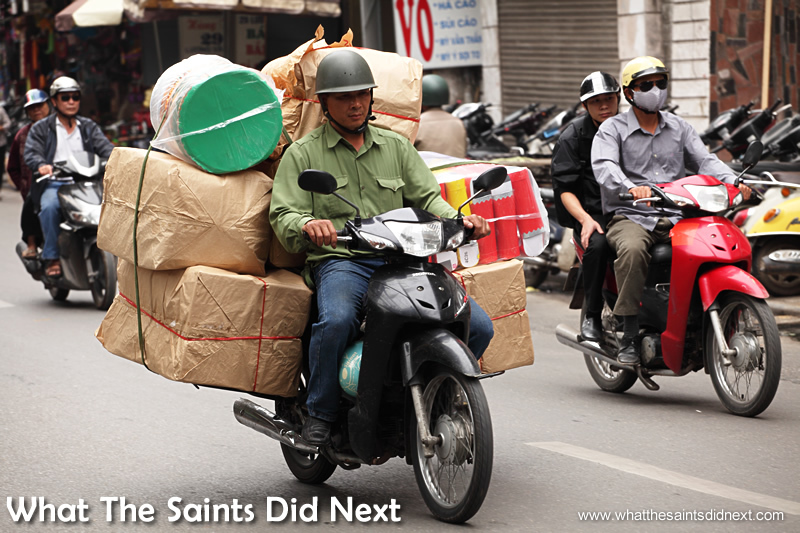 As with many Southeast Asian nations, the moped is used to carry almost anything. 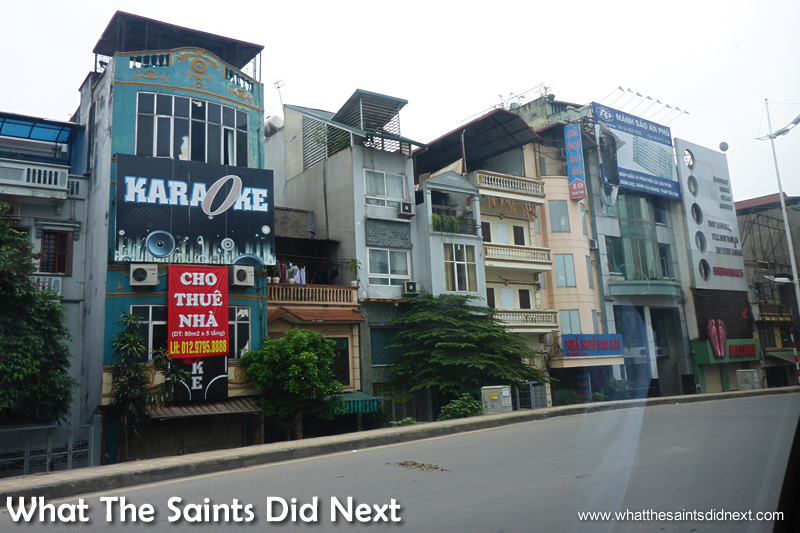 Karaoke bars are plentiful and popular in Hanoi. A Young Vietnamese Opinion On The American War. The face mask has become as much a fashion accessory as a health item. It’s coming to the end of her shift and we get to talking about people we’d like to meet, dead or alive. Mine is Prince, the singer. Hers is, “Uncle Ho,” Ho Chi Minh, the revered leader who led the country’s struggle against the French and the Americans. 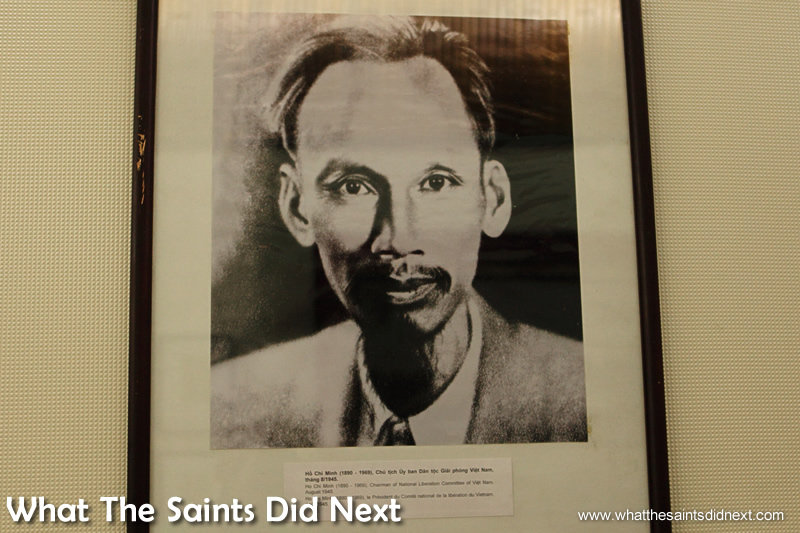 President Ho Chi Minh – photograph from National History Museum. Wearing my present from Trang, one of her beautiful handmade pieces of jewellery. A Young Vietnamese Opinion On The American War. The clock strikes 10 and Trang looks as fresh at the end of the long day as she did this morning. The same cannot be said of me. She gives me one of her handmade necklaces, rebuffing my attempts at payment. It’s beautiful and something I will treasure forever. The saying; ‘travelling is the best education,’ is spot on. Speaking with Trang tonight has been an education. So glad to have had a young Vietnamese opinion on the American War. The busy street scene at night outside the hotel while we were talking inside. A Young Vietnamese Opinion On The American War.